The land which today comprises Milford, Orange, and West Haven, Connecticut was 'purchased' on February 1, 1639 from Ansantawae, chief of the local Paugussets (an Algonquian tribe) by English settlers affiliated with the contemporary New Haven Colony. Originally, the area was known as 'Wepawaug', after the small river which runs through the town, and which has given its name to several streets in both Milford and Orange. During the Revolutionary War the Milford section of the Boston Post Road, a vital route connecting Boston, New York and other major coastal cities, was blockaded by Continental forces and Fort Trumbull was constructed to protect the town. The site of the blockade is commemorated by the Liberty Rock monument. By 1822, the town had grown large enough that residents in the northern and eastern sections of Milford chartered their own independent course as the town of Orange. During the next century and a half, the remaining section of Milford was known for shipbuilding, farming and oystering, although a small subset of industrial facilities also developed in town. During this time, Milford also became known as a beach resort for residents of New Haven and Bridgeport. Interestingly, the boundaries of the final town charter granted by the State of Connecticut in 1899 to Laurel Beach are contained entirely within Milford. Residents of Laurel Beach must therefore pay taxes to both Laurel Beach as well as Milford, and all mail to Laurel Beach residents is mailed to Milford. In 1903 the southeastern portion of the town was incorporated as the Borough of Woodmont. In 1959, the town of Milford including the Borough of Woodmont was incorporated as the City of Milford. Milford's Devon neighborhood is located at the mouth of the Housatonic River near Stratford, and features the Connecticut Audubon Coastal Center overlooking the estuary. 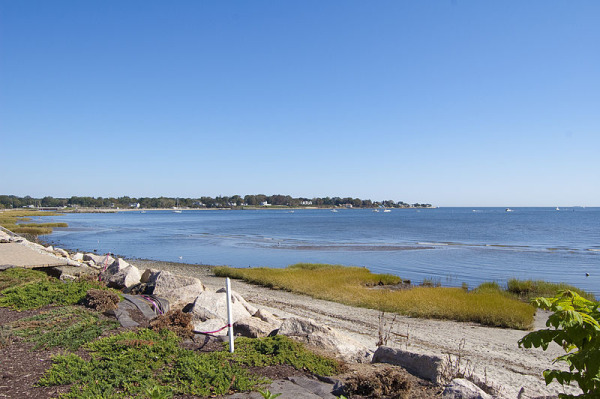 Milford also has over 14 miles of shoreline facing Long Island Sound, the most of any town in Connecticut. 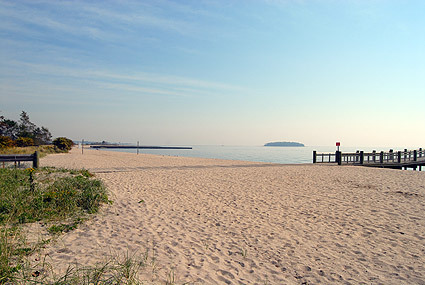 A large portion of Milford's shoreline forms the Silver Sands State Park. A newly built mile-long boardwalk was opened in 2011 that connects Silver Sands to Walnut Beach in Devon. Charles Island is also a part of the park and is a protected bird nesting ground. There is a sand bar (more correctly called a tombolo since it is perpendicular, not parallel to the coast) accessible during low tide that people can walk on from Silver Sands Beach to Charles Island.